An information resource for Support Coordinators, Local Area Coordinators (LACs) and NDIS planners. Supporting schools by providing therapists and education officers in a more flexible approach to supporting children with disability. A disability specific library that provides you with a wide range of information and resources. Flexible, customised assistance with daily living, supporting you to live the life you choose. Learn about and access assistive technologies and equipment suited to your needs. Specialised support for children and adults with disability who present with behaviours of concern. Assistance to explore your options, find the right providers and coordinate your supports. Supporting communication, mobility and living environments with therapies, equipment and modifications. Specialist therapies and supports for children with developmental delay or disabilities. 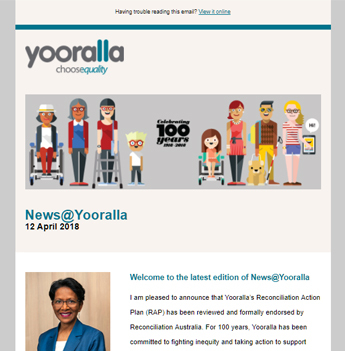 Read the latest news, blogs and statistics from Yooralla. Learn about disability from the personal experiences of people with disability, carers and the wider community.